This is a movie permission slip to send home to the parents/guardians. In this form it is editable and explains that you will be comparing the movie with the book. This is an editable form. I created this bilingual permission slip for parents to allow their children/teens to watch this movie. The slip is editable or could be printed 2 sided. This gives parents the opportunity to opt out of watching the movie Because of Winn-Dixie which is rated PG. Edit this permission slip for use with your classroom. Great to cover yourself when you are showing a PG movie as part of a unit/curriculum. 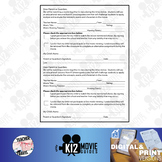 Fully editable movie permission slip to send home for parents to sign for any movie you may want to show in your class throughout the year. Easy to use and edit. Gives permission for students to watch a movie as part of a class party.